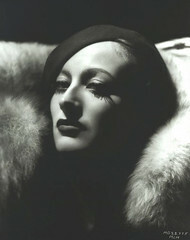 Joan Crawford, with mighty lashes. Another week, another losing battle against all of cable television in providing me something to post. The poster called out the lashes in this pic. While I agree those are some pretty amazing lashes, going to have to say the collar is why I find this one rather engaging. Don’t tar the young Miss Crawford with her later roles and appearance. She was a classic beauty throughout the 30’s and early 40’s, and thanks to the 30’s racked up an impressive on-screen wardrobe of lavish fur outfits.